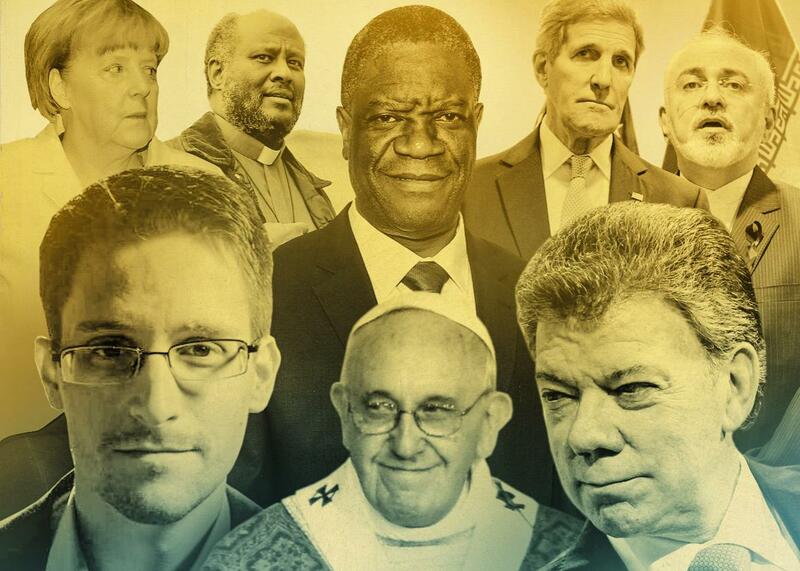 Nobel Peace prize contenders, from Pope Francis to John Kerry. From left to right: Angela Merkel, Edward Snowden, Mussie Zerai, Denis Mukwege, Pope Francis, Juan Manuel Santos, John Kerry, and Javad Zarif. Photo illustration by Lisa Larson-Walker. Photos by Getty Images and Reuters. On Friday, the Norwegian Nobel Committee will announce who will get to join the long and distinguished list of world diplomats, activists, heroes, and noted warmongers as this year’s recipient of the Nobel Peace Prize. The betting markets favor Papa Francisco, which is not surprising given his overwhelming global popularity among Catholics and non-Catholics alike. He’s helped rehabilitate the image of an ancient institution that was wracked by scandal and seemed out of step with the times. He’s spoken out eloquently on pressing global issues including climate change, economic inequality, and the treatment of immigrants and refugees. Perhaps most impressively, he participated in some actual diplomacy by working behind the scenes to facilitate the recent U.S.-Cuba rapprochement. No pope has ever won the prize, though other religious leaders including Bishop Desmond Tutu and the Dalai Lama have. (A just released tell-all memoir by the committee’s former secretary reveals that John Paul II was blocked from receiving the prize by a Lutheran bishop on the panel.) If any pope is going to break the losing streak, it’s probably this one. The Italy-based priest has been nicknamed Father Moses for advocacy on behalf of migrants attempting to make the dangerous journey across the Mediterranean to Europe. He runs a hotline for migrants in distress at sea or making the dangerous passage through North Africa, has founded a charity to advocate for refugees’ rights, and serves as a kind of informal ambassador for the growing population of refugees escaping repression in his native Eritrea. He’s certainly not as high profile as Francis, who has met with Zerai, but recognizing his work might be more in the spirit of the pope’s message. It might seem surprising given that she spent much of the year being compared to Hitler by enraged Greek protesters and making children cry on live television, but the German chancellor is considered a strong contender this year. The widely cited veteran peace prize forecaster Kristian Berg Harpviken has her in first place on his annual shortlist. This is due in part to her surprising emergence as Europe’s voice of conscience during the refugee crisis: Germany has taken in the highest number of people and led the calls for other countries to do their part. But she was actually nominated for her role in brokering a cease-fire in Ukraine. Merkel winning still seems like a stretch. Germany has backed away a bit from its welcoming stance on refugees, and while Vladimir Putin may have turned his attentions to Syria, it’s still way too early to assume that the fighting is over in Ukraine. Also, Merkel is despised in much of Europe for the controversial austerity policies pushed by her government. This would a controversial pick. Harpviken also likes the odds of the president of Colombia and the commander of the left-wing FARC rebels to be rewarded for the recently announced peace deal that could bring an end to the conflict that has killed over 200,000. However, a number of details still need to be ironed out and some of the FARC’s recent statements aren’t that encouraging. The Nobel committee has been burned before on peace deals that were too good to be true: see the 1994 award to Yitzhak Rabin, Shimon Peres, and Yasser Arafat. For an award dedicated to peace, the Nobels more often reward pragmatists than pacifists. This is, after all, an award that Henry Kissinger won but Mahatma Gandhi didn’t. If the committee really wants to reward principled nonviolence, though, it may choose the movement to preserve Japan’s pacifist constitution amid the government’s increasing militarism. Mukwege, a leading Congolese gynecologist who has treated thousands of victims of sexual assault in the country’s long-running conflict and been a high-profile public advocate for them, is mentioned as a leading contender almost ever year. He won the EU’s highest humanitarian award, the Sakharov Prize, in 2014. Thanks to ISIS’s uniquely horrifying crimes, the committee may want to highlight the issue Mukwege’s works on this year. Another perennial contender is Gene Sharp, the academic expert on nonviolent protest tactics whose work has helped inspire and instruct mass movements against dictatorships from Serbia to Tahrir Square. My colleague Will Dobson made the case for him to receive the prize in 2013. John Kerry’s critics suggest he’s had his eye on the prize for quite some time. Kerry should “take his Nobel Prize and leave us in peace,” an exasperated Israeli defense minister Moshe Yaalon said last year. This year, the U.S. secretary of state along with his Iranian counterpart and the other foreign ministers of the P5+1 are potential Nobel contenders for the recently negotiated nuclear deal. I don’t think this is very likely or prudent—let’s give the deal a few years to work before we celebrate it—but as someone who writes about politics, part of me wants to see it happen just for how angry it would make U.S. Republicans and how uncomfortable it would make the White House. Betfair, the British betting market, has Snowden at 12-to-1 odds. (Chelsea Manning is at 22 to 1.) The exiled whistleblower did win the Right Livelihood Award last year, the Swedish human rights prize known as the “alternative Nobel.” The Nobel committee has taken the opportunity to tweak the White House in the past—see the awards given to Jimmy Carter and Al Gore during the Bush administration—but Snowden seems a little too hot to handle for them. One of Russia’s last independent newspapers, Novaya Gazeta is considered a contender for recognition of its incisive and critical investigative reporting, despite continual pressure from the Russian government. The murder of the paper’s reporter Anna Politkovskaya nine years ago this week caused international outrage. Blogger Raif Badawi, sentenced to 10 years in prison and 1,000 lashes in Saudi Arabia for perceived insults to Islam, is another potential candidate. After a brutal year for journalists that saw attacks on reporters, bloggers, and cartoonists from Paris, to Syria, to Bangladesh at the hands of both governments and terrorists, either one would be a very worthy pick.